A combination of creativity and functionality allows you to imagine the piece of furniture they need! Change the colours of the slipcover or plan a spare set. Le home-sitting s’applique différemment mais se trouve très intéressant pour les personnes qui ne veulent pas engager un service de gardiennage mais qui veulent se faire garder leurs logements et si nécessaire leurs animaux. mariefrance.fr - House and Design - Giusypop, a perfect harmony between pets well-being and interior design. Why choose a pet bed with removable covers? A bed for dogs or cats must be absolutely removable, but be careful with the washing labels! What is the Martindale test? It is a European way to measure the wear durability and resistance of your pet’s bed use. The Martindale process is used to evaluate the wear resistance of fabrics and thus guarantee the long-term use of your pet's bed while maintaining its original appearance. Why an orthopedic mattress for dogs or cats? An orthopedic mattress for dogs or cats: fashion phenomenon or necessity? Read the article (in French): "Tendance Savoie Mont-Blanc"
Giusypop, the French brand specializing in luxury comfort for dogs and cats combining robustness, elegance and practicality . 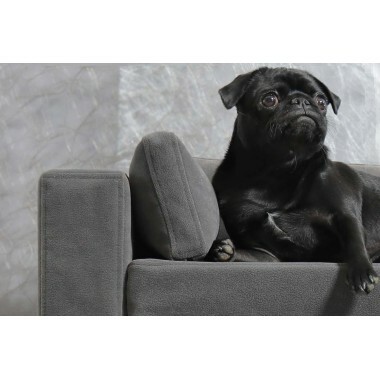 Designer furniture for dogs & cats - A perfect harmony between their well-being and interior decoration. By continuing your browsing on this site, you agree to the use of tracers (cookies) in order to make anonymous statistics of visits, offer you content and services adapted to your interests and allow you to share information on social network (see legal notice). By continuing your browsing on this site, you agree to the use of them. For more information parameter, click on this link KNOWLEDGE+.